I always assumed that AAT vanished from pop culture when the original Battlestar Galactica went off the air and didn't really come back into vogue until The X-Files. There were a few one-offs here and there, and the meme was embedded into subtler narratives like the Prophets subplot in Star Trek: Deep Space Nine, but it seemed that it was definitely out of fashion for a good long time. The reason being is that I wasn't watching a lot of cartoons at that time. In fact, the theory that dare not speak its name has been a staple in kiddie cartoons since the late 70s. A helpful reader tipped me off to this short-lived series Space Sentinels, from the producers of Shazam and Isis. The concept (if not the execution) is fascinating- a trinity of gods are guided by a Artificial Intelligence to act as the protectors of mankind. You had Hercules (looking a lot like the Lee/Kirby Thor), Mercury and Astrea, an obvious stand-in for Astarte/Ishtar/Hathor with bonus shapeshifting powers. Isis and Hercules (aka Herucles) teamed up soonafter in another Filmation production The Freedom Force. This show didn't make much of an impression either, but it certainly prefigured what Alan Moore was doing with his true masterwork, The League of Extraordinary Gentlemen. Bonus factoid: Filmation co-founder (and astonishingly prolific polymath) Norm Prescott worked on the new music score for the American dubbing of the Steve Reeves Hercules film, which kicked off the Greco-Roman revival of the sword and sandal films. Indeed, Filmation seemed to be a major part of the animated AAT invasion. In 1973, Filmation director Hal Sutherland took the reins for Star Trek: The Animated Series, which reunited Gene Roddenberry and most of the Star Trek principals. Again short-lived, but a truly fascinating experiment in bombarding young children with dense, obscure sci-fi that taxes the attention of most adults. But one of the seminal episodes had the Enterprise crew tangle with the feathered serpent Kukulkan, who claimed to be the creator of the human race. You can watch the whole thing here. He is the leader of the Autobot Pretenders and Headmaster Juniors. Metalhawk is known as "Hawk" when in his human guise. 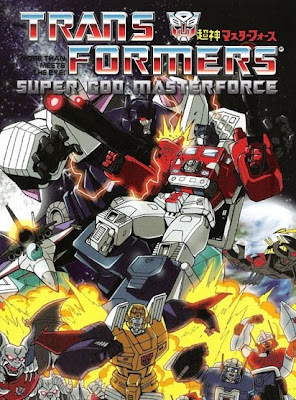 Eight thousand years ago, a star ship containing the Autobot Pretenders Metalhawk, Lander, Diver and Phoenix pursued the Decepticon Pretenders Blood, Dauros and Gilmer to neolithic-era Earth, where they crashed. Using their Pretender abilities, the Autobots adopted the form of humans - not using external shells like in the American fiction, but actually transforming the very structure of their bodies into an organic equivalent, shrinking down to normal human size to hide in plain sight among burgeoning humanity. The Decepticon Pretenders, on the other hand, adopted the forms of monstrous creatures, becoming feared as demons by early man. After many battles, the Autobots succeeded in defeating their enemies and sealing them away - Blood in the pyramids of Egypt, Gilmer in the ruins of Atlantis, and Dauros beneath the Nazca Lines in Peru - for thousands of years. Here's another series I had no concept of, since it fell between my two boys' cartoon-watching prime; Mighty Max. This series is a catalog of esotericism-for-kiddies storylines, and may be the only cartoon in history to name an episode after a Kenneth Anger movie. Then there's this episode that showed that someone on staff had been reading their Robert KG Temple. Note that the villain is named Nahmo (read:"Nommo"). Aliens from a planet orbiting Sirius come to Earth, and while trying to stop them Max unwittingly starts a heated argument between Norman and Virgil that keeps them from working together through the entire episode. Max finally gets them to settle the dispute and work together. Aboard the aliens' ship, Max finds out that they've been stealing toxic waste, a source of fuel for them, and happily let the aliens go on their way with it. Max's mom again finds herself in danger when a ring placed on her hand compels her to go to Egypt. Following out of concern, Max and company find that the ring belongs to Isis, an ancient Egyptian goddess who has been living among humans for a few thousand years. Now a little unhinged, she is attempting to awaken her husband Osiris hoping that he will destroy the human race for its many faults and injustices. However, Osiris spares humanity after learning Max is the "Chosen One" and departs along with his wife. Max's birthday falls on the Winter Solstice, the day that is filled with the most darkness. Skull Master, having now reforged his crystal of souls and filled it with the souls of the citizens of Dragon Island, now puts in to play his final plan for victory he has been working towards ever since his escape from Skull Mountain. Virgil and Norman show up at Max's birthday party to show him the prophecy in their home in the Himalayas Mountains. Then there's the 90s Jonny Quest revival, which featured 'The Return of the Anasazi'. It's a pretty blatant X-Files knockoff, specifically the definitive mytharc three-parter of 'The Anasazi', 'The Blessing Way' and 'Paper Clip', all of which were inspired by Chris Carter's participation in a Navajo peyote ritual. The irony here is that Race Bannon is voiced by Robert Patrick, who'd emerge as Oannes Doghead on The X-Files. Then of course there's Yu Gi Oh, which is like shooting fish in a barrel. But that's Japanimation for you. The problem is that nearly all of their favorite franchises are based in AAT, which leads to a state of cognitive dissonance in the community one can only describe as pathological. It also raises the question as to how effective all of this memetic embedding is if the people who immerse themselves in this kind of entertainment the most are the most resistant to the messages being put across in these narratives. Maybe we're not quite the mindless robots some might believe us to be. *It's similar to how working class Americans see themselves just a lucky break away from becoming billionaires, so they can't stand to see anything done to threaten offshore tax shelters, outsourcing or egregious tax breaks, even if it all threatens their own economic well-being.